A Jeunesse rep may be using Twitter in a bid to raid downlines of other MLMers. On Oct. 24, the PP Blog reported that Truth In Advertising (TINA.org) had raised concerns about health-related claims surrounding the Jeunesse MLM, including a claim from an apparent rep that a product known as Jeunesse Reserve had reversed the course of gangrene in a patient with diabetes who was facing an amputation. Today the PP Blog is reporting that an apparent Jeunesse rep with a Twitter handle and email addresses that suggests he is a lawyer may be trying to raid downlines at MLMs such as Vemma, Usana, Amway, Mary Kay, Zhulian and others. Jeunesse did not respond immediately to a request for comment from the PP Blog. We’ll publish the comment, if received. Included among the graphics of the promo was one that read “MLM Transfer Your Downline Into Overnight Millions.” Another graphic suggested that MLMers who moved to Jeunesse and took their downlines from other companies with them could earn more than $270,000 in two weeks and $800,000 in a month. 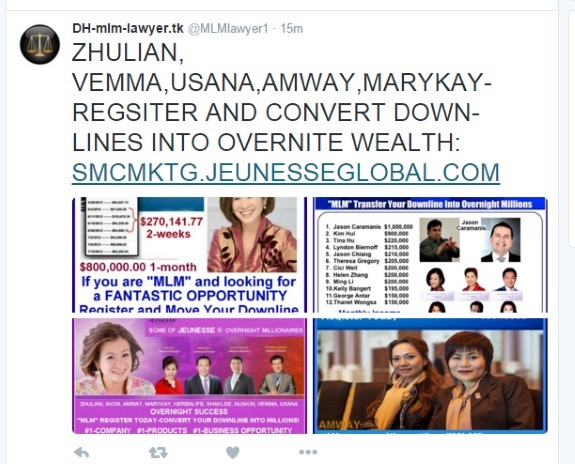 Another graphic listed the names of Zhulian, Avon, Amway, Mary Kay, Herbalife, Shaklee, Nuskin, Vemma and Usana. It further claimed Jeunesse produced “OVERNIGHT MILLIONAIRES” and that people who moved their downlines from other companies to Jeunesse could “convert” those downlines into “millions” of dollars. Avon, Herbalife, Shaklee, NuSkin and Usana are publicly-traded companies. Vemma is the current subject of an FTC pyramid-scheme prosecution. Another promo for Jeunesse on the “DH-mlm-lawyer.tk” Twitter account suggested that Jeunesse somehow was affiliated with the Nobel Prize. Jeunesse is not a publicly traded company. David is indeed from Thailand. He also registered all over the place, sometimes claiming background in antique collectables. His tumblr blog claimed that Giampapa and Newman were awarded Nobel Prizes, when Giampapa was merely nominated. Nathan Newman, AFAIK, was never even nominated. Makes you wonder if these folks actually read and speak English, doesn’t it?